I calibrate my growth rates on the assumption that Apple will overtake the combined share of the two money-losing handset vendors. 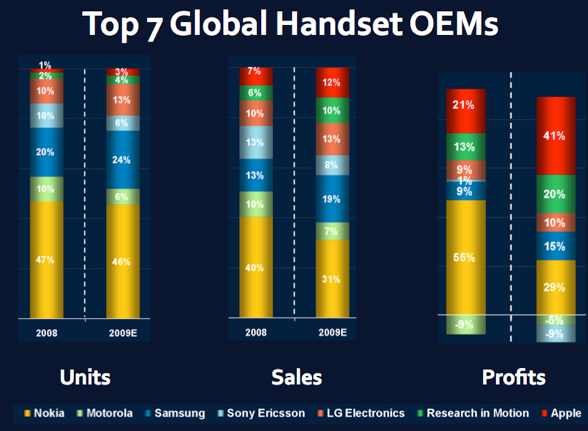 Sony Ericsson and Motorola are the weakest competitors in terms of portfolio and competence with software. Their sales, units and profits shares for 2008/2009 are shown in the graph above (source: Morgan Stanley). Therefore, my thesis is that Apple could beat these two weakest competitors in 3 more years. 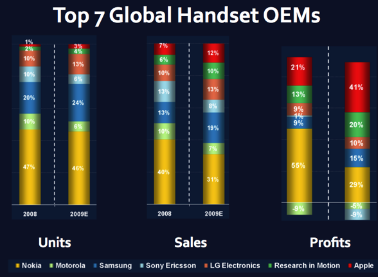 During the last quarter, Sony Ericsson held 4.5% share and Motorola 3.7% therefore my 2013 target for Apple is a little less than the sum of what these two hold today. This results in unit sales for Apple of 125 million units for 2013 and a compound annual growth rate of 50% a year.